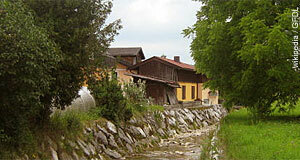 Thalgau is a community on the verge of the Salzkammergut, some 20 kilometres east of the city of Salzburg. It is situated in the Flachgau area and well-connected to the capital via a motorway exit. Thalgau has a population of approximately 5,300, a typical size for a Flachgau commuter′s village. Modern Thalgau can be tracked back to the year 788, when its name was first mentioned in the archives of the Prince Archbishop of Salzburg. However, the area of Thalgau has been populated at least since Roman times. Like most of the communities in the surroundings of Salzburg, Thalgau has benefited a great deal form the rapid economic development following the end of WWII. Thalgau was flooded rather badly in 2002. The motorway exit led to the development of many trade and logistics companies and in the 1980ies, the Japanese technology company SONY established a large plant for record production here. This and many other companies have led to increased wealth for Thalgau, but also altered the periphery of the village towards a more commercial appearance. Thalgau is not overly touristy, if visitors come, then usually on their way to the Salzkammergut. However, due to the excellent link to Salzburg, Thalgau might well offer a cheaper deal for accommodation between Salzburg and the Salzkammergut than either of the two could. In Thalgau itself, there are some decent opportunities for hiking - note that Thalgau is part of a tourism marketing platform that unites the municipalities of the Osterhorngruppe mountain range. The Schober mountain belongs to Thalgau and features in our recommendations for Salzburg hiking. For sightseeing, note also the parish church, which dates back to 1755 and is in late Baroque style. Here you will also grasp immediately that Thalgau has been a small village for most of its history and that the population and economic growth is a phenomenon of the past 60 years.